When thinking of an accomplished woman, Alexandra Champalimaud absolutely fits the bill. I was lucky enough to be able to sit down with the designer in her offices last week, where we were able to discuss her work and interests. She proved a delightful conversation partner whose knowledge of the arts and design is impressive and engaging. 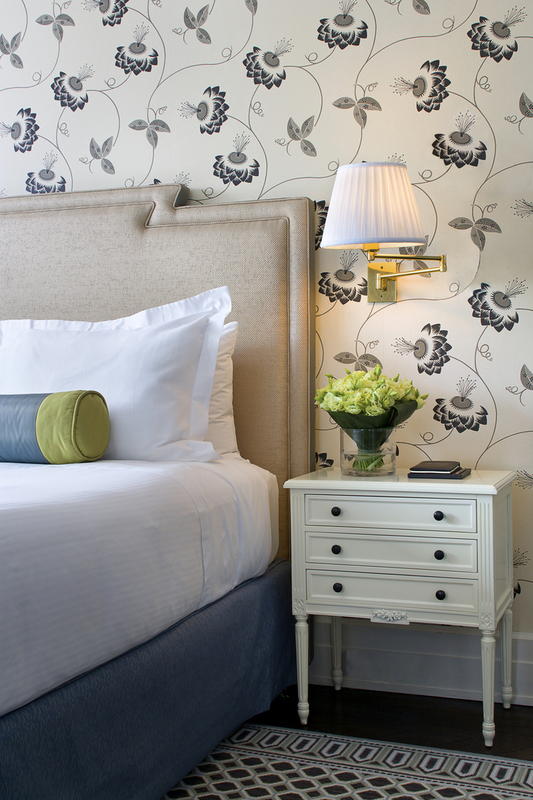 Recently, The Carlyle revealed it's newly renovated rooms, which Champalimaud designed. The collaboration is the continuation of a relationship between Rosewood Hotels and the New York-based designer which formed after a long phone interview with one of the owners and recognizing that they had many similarities. "It was great to talk about all I'd studied and what related to the work and what was relevant. So I ended up doing some work at the Ritz-Carlton in St. Louis to sort of test the waters, and from there we decided that it was a very good fit to do the Carlyle. Because I love stories... and I love designing with and for and all about stories." uch an affinity is a perfect combination for an institution like The Carlyle, which has housed just about any important historic dignitary one can think of-- from presidents to royalty. There are so many wonderful and interesting stories linked with the hotel that they practically fortify it's foundation. Another way in which Champalimaud and The Carlyle are well-matched is in their academic historic appreciation. Walk through the halls of the hotel and one can feel the presence of people who shaped the world so long ago. Not only have artistic and historic movements been influenced from within the walls of the hotel, but the Upper East Side institution has been known to pay an intelligent homage to them. Champalimaud was trained at Espirito Santo Foundation in Lisbon, Portugal, which is one of the last remaining colleges that teaches traditional European arts, crafts and techniques of historic preservation and restoration. This training gives her a unique and layered perspective on space and design that melds her intellectual curiosity well with that which the hotel promotes. Acting upon her training, Champalimaud took her love of European art and applied it to the sensibilities of New England culture, down to analyzing the reasoning behind the American Art Deco movement, which was much more about breadth than in other parts of the world. She took the stories of the people have stayed in the hotel and respected the fact that the place has a certain chicness that goes along with the fact that it is an aristocratic institution where "the game has been played." "It has a soul," she says. "It has idiosyncracies... that have a story to them." And yet, nothing is ostentatious, she notes. It is a subtlety that suits her style well. So much so that she spends time there outside of her work. She has friends who stay there, she has breakfast there. "The uniqueness feels special-- which it is." While staying at The Carlyle last week, I was joined by Champalimaud staffer Inna Shnaydman in what can only be qualified as a dream tour of the latest Champalimaud rooms and the storied Royal Suite. Our tour guide was the hotel's marketing manager, Jamie Beck, who, despite working in the hotel every day, clearly continued to be awed by the interior's details such as colored ceiling mouldings and carefully chosen wallpapers by Neisha Crossland. We all felt an enhanced feeling of being at home on our best day, which is precisely what the hotel wants to evoke from it's guests. The Royal Suite is 1,800 square feet of pure fantasy that boasts floor-to-ceiling lacquered walls, a grand piano and a full kitchen with service entry. There are two bedrooms, two full baths and plenty of little extras that make the resident feel as that there their stay is better than home. One could lock themselves in and never come out. The coming together of Alexandra Champalimaud and Rosewood serves to give a proper definition to the term "elevated living". The partnership has produced a lavishness that is equal parts intellectually stimulating. It has produced a continuation of the timeless elegance that gives The Carlyle it's everlasting appeal.